This is a sponsored post written by me on behalf of Smirnoff . All opinions are 100% mine. 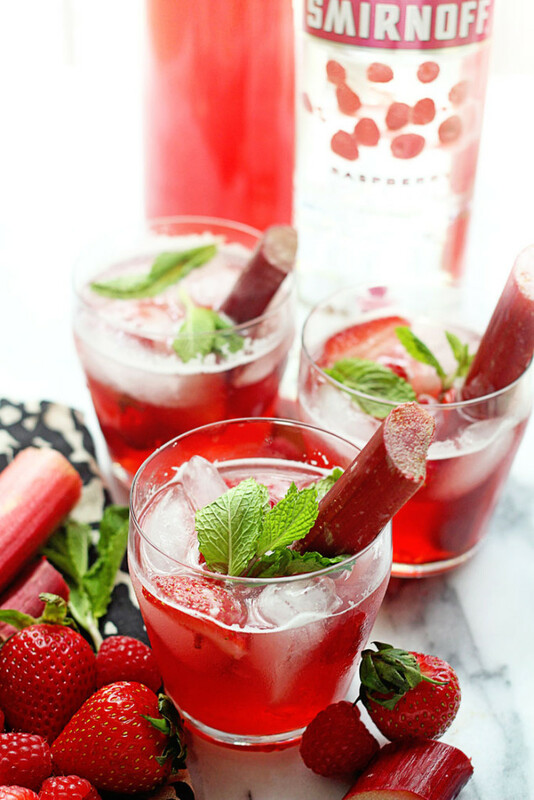 Flavorful and Fun Berry Rhubarb Punch featuring Smirnoff Raspberry. 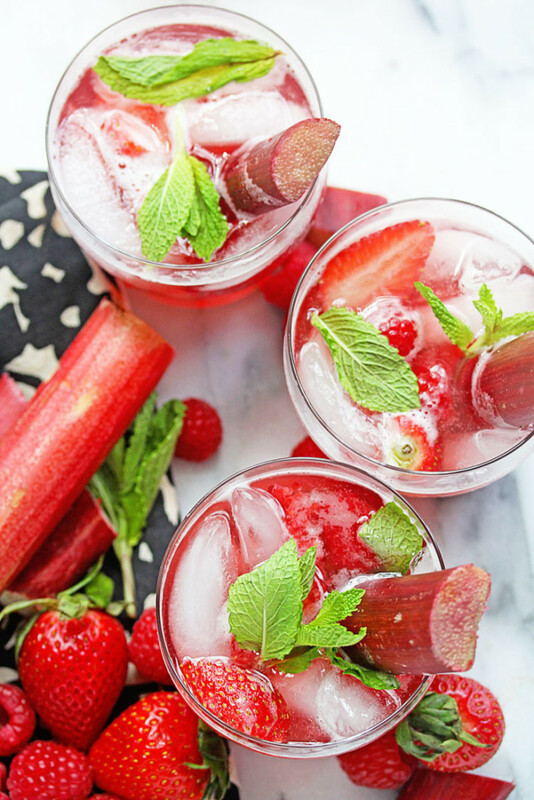 This is the perfect summer drink for entertaining! This summer, I’m excited to partner with Smirnoff to share some delicious, simple and fun punch recipes that are sure to make your next summer gathering unforgettable. June marks the official start of summer fun. It is not only my birthday month (my bday was on the 7th but I’m still accepting gifts), it is also Pride Month! Most consider pride month a celebration exclusive to the LGBT community but Smirnoff and I believe pride is all about inclusion so that means anyone and everyone can participate! Smirnoff’s motto “Exclusively for Everybody” says it best. Pride month is all about being yourself and celebrating who you uniquely are, and anyone can do that! The LGBT community will be kicking off celebrations throughout June all over the country from New York to San Francisco, and you can have just as much fun planning celebrations of your own! I recommend you start with this Berry Rhubarb Punch. Not only is this punch simple to make, it is filled with in-season fruit and vegetables that truly capture the spirit of summer. Strawberries, raspberries and rhubarb are not just for your summer pie baking. Together, they make one mean punch brimming with seasonal flavor and dramatic colors. The punch begins with a berry rhubarb simple syrup that creates the most fantastic deep ruby color. Coupled with ginger-ale and Smirnoff Raspberry, which has the most subtle yet amazing hint of raspberry essence, the final recipe packs a fantastic “punch” (pun intended) of tangy fizz, fruity deliciousness, refreshing mint, sugary sweetness and responsible alcoholic bliss. I’m sure you will want to make this time and time again for your adult parties this season. Want to join in on more #Pride4Everybody and Smirnoff punch fun? Follow along with Smirnoff on Instagram , Pinterest and Facebook. 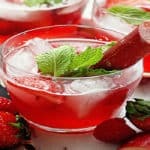 Add water, sugar, strawberries, raspberries, rhubarb and mint to a medium sized pot over medium high heat and stir together allowing sugar to dissolve. Bring liquid to a boil then lower heat to medium and continue to simmer for 15-20 minutes. Turn off heat, strain the mixture leaving just the liquid. Cool to room temperature. Add Raspberry Smirnoff and ginger-ale to simple syrup and stir together until well combined. Add berries to punch then add to pitcher. 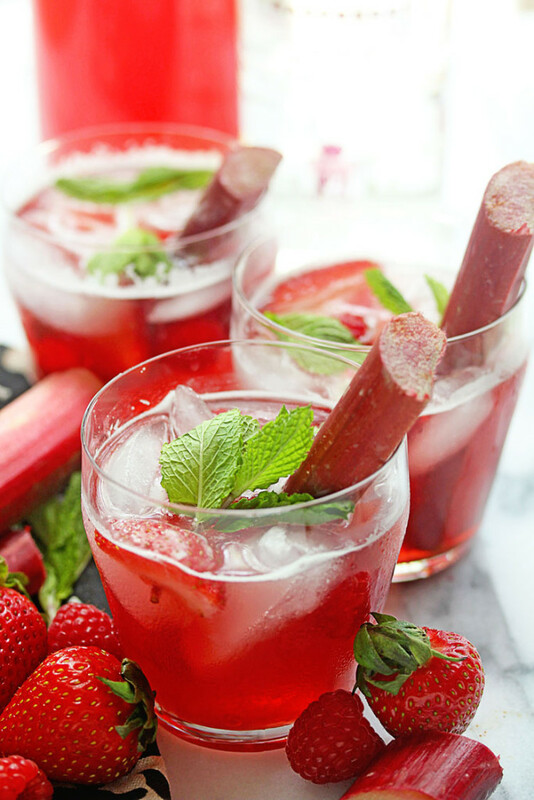 When serving punch, fill glasses with ice, pour in punch then add one mint leaf and one chopped rhubarb stalk straw to each glass and enjoy! Rhubarb has always been one of my favourite summertime treats. I’ll have to try turning it into a boozy punch. Yum! Love this drink – so refreshing and perfect for summer! I want a GALLON of this right now! This punch sounds amazing! I feel like rhubarb is so underutilized but is SO delicious! This is a perfect party drink! It completely is! I totally agree. Awww chucks!!! Party ova here!! Yes, yes, and more yes! This cocktail sounds like pie in a glass and I like it. Woo, I still have some Rhubarb left and this Punch might just be its next destination 😉 Looking yum! This berry rhubarb punch makes me want to sing Lana Del Rey. Punch and indie are definitely summer essentials. Definitely wish it was summer here in Australia so I could kick back with one of these punches! I love raspberry smirnoff so I do need to make this recipe. YUM..
Love the colorful punch! it looks so vibrant and refreshing. Perfect for summer and Pride, our city’s parade passes through my neighborhood, it’s always such a fun time! This is my kind of punch! Perfect for any celebration! This is really gorgeous. And I love the message in this post! I’ve got family coming to town this weekend and now I know exactly what I’m going to whip up for us to drink on! Thank you Liz! And this is perfect for your weekend fam get-together! Love everything about this and it better happen this summer. Over and over. It must happen as much as possible! Stop. Berries + rhubarb + mint? Oh and a healthy dose of wodka? Yas yas yas!!! Yep a very healthy dose of vodka! J, I love this rhubarb punch!!!! I love more that Smirnoff is running a campaign like this! Pride month! love it! Yeah this punch is seriously going to be made several times this summer boo! What a delicious looking punch and a great way to start the celebration for pride month!! Love this post!! Thank you so much hon! Pride is about celebrating everyone! Not only is this cocktail sunningly beautiful, it also sounds refreshingly delicious! 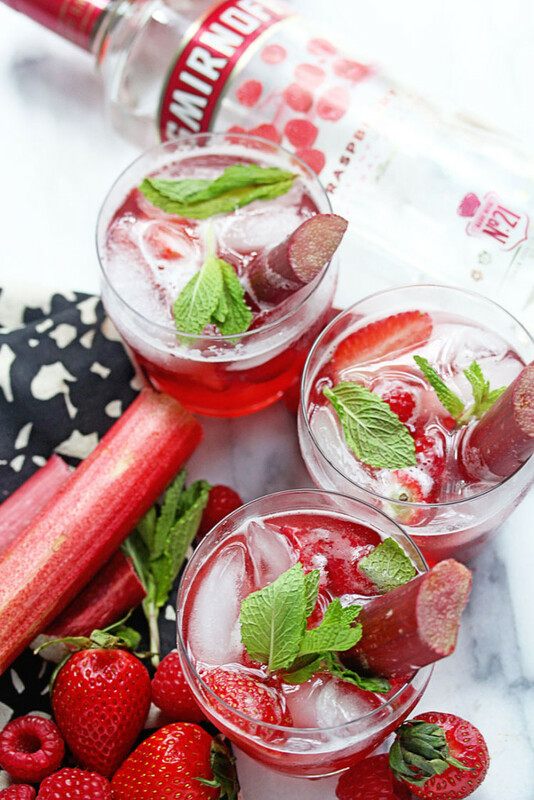 I love the combination of flavors you have going on here – the berry rhubarb simple syrup sounds scrumptious and a perfect pairing with ginger-ale and Smirnoff! Can’t wait for 5 (okay maybe 3) o’clock to roll around, because I will be toasting the start of the weekend with these! Cheers!! Cheers to you too and thanks hon! Ah, nothing like a good SPIKED PUNCH! Woot woot! I totally agree. Same here. I could go for another round of this! I always have Smirnoff raspberry on hand, because it just goes so great with Friday night! And then you added rhubarb, and I discovered what I will be sipping on all weekend long! Pinned! Perfect friday summer recipe. Love you! Girl I am alll about anything with rhubarb! This punch is beyond gorgeous and I love all the fabulous flavors that are going on here. Love that “exclusively for everybody” tagline too! I love that tagline too! And these flavors seriously are now my absolute fave! Thank you hon! I adore it too! It’s so awesome for the weekend!! !